2015: Carico formed a partnership with Summer Ross and in their first AVP tournament together they placed second. The duo was third in their other two domestic events together. Carico led the Tour in digs (6.68 per set). Internationally, Carico and DiCello had a best of ninth in their six FIVB tournaments. Carico and Ross also played six FIVB events together, with a best of fifth twice. 2014: Carico began the year playing two AVP events with Brittany Hochevar, finishing third both times. 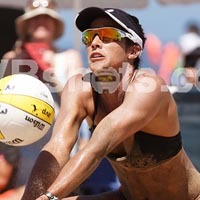 She then teamed with Kim DiCello, and after a 13th, they placed third in the last four AVP events. Carico ended the season ranked second in aces (.92 per set), fourth in digs (5.95 per set) and seventh in hitting percentage (.425). On the FIVB Tour, Carico and Hochevar played four times, with a best of 17th, and Carico also played four times with DiCello, with a best of fourth. 2013: In her first full season playing pro beach volleyball, Carico teamed with Heather Hughes. In the AVP season opener the duo advanced from the qualifier and placed fifth. In six tournaments they had three fifth-place finishes. Carico ended the year second in digs (5.91 per game) and fifth in aces (.73 per game). The duo competed in three FIVB tournaments, improving each time from 33rd to ninth. On the NORCECA Tour, Carico and Hughes won twice in five tournaments, advancing to the semifinals each time. She also played once with Sara Hughes, and earning a win. Carico and Emily Stockman played one NVL event together, finishing ninth. 2012: Carico and Lee played in one domestic event, advancing from the qualifier and placing 25th. 2007: Carico played in one AVP qualifier with Lynnsy Jones. She also finished ninth in the FIVB U-19 World Championships with Falyn Fonoimoana. 2006: Carico made her pro beach volleyball debut at age 16 in a qualifier at Manhattan Beach with Ashley Lee. College: Carico played indoors four years at the University of Miami where she was a two-time AVCA All-American. As a senior in 2011 she was named both the Atlantic Coast Conference Player of the Year and Scholar-Athlete of the Year. In 2012 she competed in sand volleyball for Georgia State University, where she reached the AVCA National Championship semifinals with Katie Madewell. Carico was named an AVCA All-American in sand volleyball. Personal: Carico has a brother, Weston, and an older sister, Taylor. Taylor played three seasons at USC and one at Minnesota. Carico was team captain at Mira Costa High School, which went 37-0 her senior season and 37-1 her junior year. Mira Costa won the state championship all three of her years there. On December 31, 2015, she married Canadian beach volleyball player Chaim Schalk.